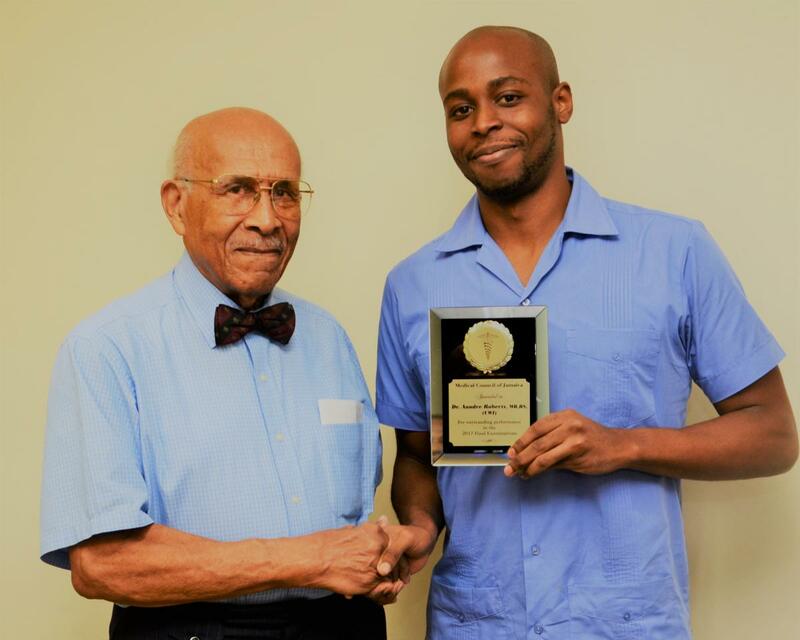 presents the MCJ most outstanding graduate, FMS,UWI, Mona Campus award to Dr. Aundre Roberts. Registered Medical Practitioners in keeping with the Amendments to the Medical Act (1996, 2004) must possess a practicing certificate renewed annually. This requires that the Council is satisfied that the practitioner has complied with the prescribed requirements for continuing medical education (CME), 20 hours as of 2014. 2 hours of which must be in ethics. The appropriate renewal fee must be paid between January 2 and end of February of the year. The penalty for payment after this date is the fee is doubled and the practitioner is practising illegally with medico-legal implications. See this article by Dr D.E Aarons West Indian med. j. vol.56 no.3 Mona June 2007. Medical Council of Jamaica apologises for names inadvertently omitted and request that contact be made with the Council (Tel. # 9223116). The Medical Council of Jamaica would like to first express our sincere gratitude for the support and co-operation you have consistently given to us. Please carefully note that we have relocated, our current address is stated above. Looking forward to welcoming you to our new location! on Thursday January 19 at 10am in the Minister’s Conference room at the RKA Building, 10-16 Grenada Way. In relation to the Regional Authorities the Minister requested Council to prepare a document outlining the reasons why Council thought these bodies were not performing and make recommendations within a short period. The Council agreed to form a Committee and recommendations would be forwarded to the Minister’s office. Medical Council of Jamaica wishes to instruct all doctors that requests for mandatory HIV antibody testing for individuals to enter into or renew contracts or for promotions is strictly prohibited. 2Additionally in Jamaica the Office of the Prime Minister and the Office of the Cabinet- HIV/AIDS Workplace Policy (December, 2008) speaks to non-discrimination at the workplace. 3The Ministry of Labour has a Workplace Policy passed in Parliament in February 2010 which clearly states that there should be no workplace HIV –antibody testing (whether for pre-employment screening, pre contractual screening, for promotions or renewal of work contracts. REGISTRAR MEDICAL COUNCIL OF JAMAICA JANUARY 24,2017. The Medical Act requires that registered medical practitioners renew their Practising Certificates annually This exercise must be completed between the first week of January and the end of February. Renewal after the end of February attracts a doubling of the fee and until this is done doctors are practicing illegally. Note the penalty for late renewal is doubling of the fee. In addition to the fee all practitioners except doctors in postgraduate programmes, and SHOs require 20 CME hours of which there are 2 mandatory hours in ethics. Medical Council continues to get requests for the penalty to be waived based on individuals not remembering cut off date, doctors especially junior doctors in the public sector not having enough free time to pay the fee at the medical council’s office and so on. Doctors are reminded that the fee may be paid by cheque sent by mail, direct deposit to the MCJ’s bank account, asking a friend, messenger or colleague to deliver payment with evidence of required CME hours and certificates can be collected at the same time or posted out to addresses provided. All this information is contained in reminder letters mailed out to all doctors in MCJ’s registry annually at considerable cost. Many letters are returned with stamp “individuals not known”. 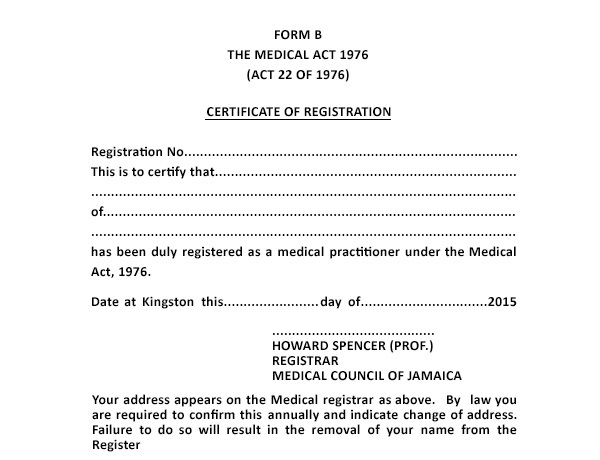 Doctors are reminded that the medical act requires doctors to provide their up-to-date permanent addresses and this information is printed on the registration certificate (see attachment). “The register shall be open for inspection by any member of the public at all reasonable times, and a copy of the register shall be published in the Gazette by the Registrar at such times and in such manner as prescribed. 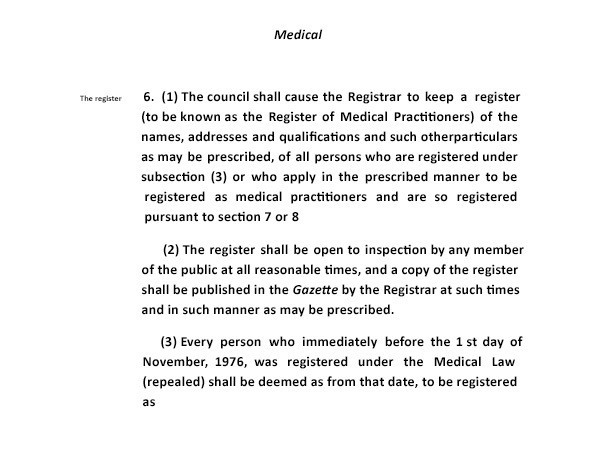 (Medical Act 6 (2)”- see attachment). Last publication of the register was in 2011 and the next publication will be this year, 2015. The time between publications is related to the cost. 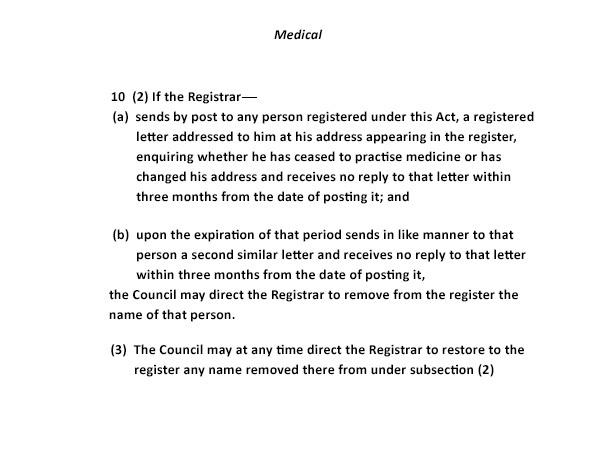 The consequences of not providing one’s permanent address is set out in the act 10 (2) (a) (b) and may result in removal of a doctor’s name from the register. The act directs removal if a response to either of two registered letters sent over a 6 month period is not received. A proposal will be made to Council that all returned mail will be processed and registered letters will be sent to individuals whose names appear on this list. If no response is received after two registered letters the individual will be removed from the Register. The offices of the MCJ was moved to 37 Windsor Avenue in March 2014. Notices were placed in the news media and on the MCJ website jamaicamedicalcouncil.org. A directions map was also placed on the website. Notices were posted in the Ministry of Health Building, 2-4 King Street, which housed the previous offices of the Council prior to the move. A reminder of the new address was included in the annual mail out of notices to all doctors in our register. It was therefore surprising the number of doctors who were unaware of the move and the address of the new office at 37 Windsor Avenue which was confused with the MAJ’s office. Ms Vancetta Barnett retired from the post of Secretary to the Registrar in the Medical Council of Jamaica on December 31, 2014. She has served the Council faithfully for over 26 years. Ms Barnett and Mrs Inez Robinson-Gammon have been the pillars of support for the Council over these many years. Speaking at the function in recognition of her service Ms Barnett recounted her experience working with different Registrars. She also spoke about the Council functioning on a limited budget but always getting the work done. 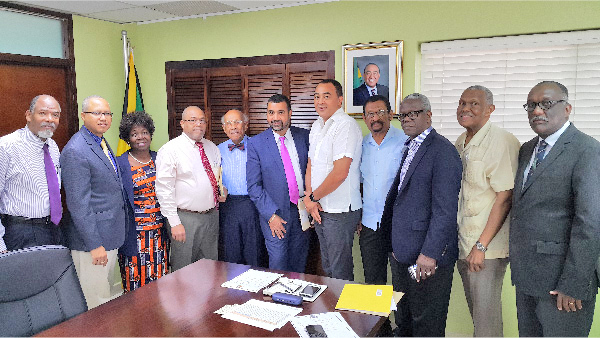 Amid growing concerns about falling health-care standards at some of the country’s public health facilities, the Medical Council of Jamaica is warning doctors that they could be banned from practising locally if they fail to meet the annual continuing medical education (CME). The Medical Council has taken note of the discussion in the press regarding stem cell research. Council has also noted that Dr Janice Simmonds-Fisher, in her article published on December 4, 2013 in The Gleaner, has stated that the Medical Council of Jamaica has given approval and its blessings to this form of therapy. Letter to the new Minister of Health.